You can download Edgar Rice Burroughs' John Carter: Barsoom Series (7 Novels) A Princess of Mars; Gods of Mars; Warlord of Mars; Thuvia, Maid of Mars; Chessmen of Mars; Master Mind of Mars; Fighting Man of Mars for only 0.99$ here! That's over 1200 pages for less than a buck! 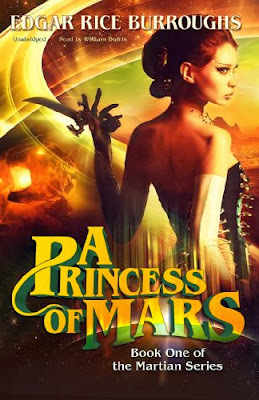 When John Carter goes to sleep in a mysterious cave in the Arizona dessert, he wakes up on the planet Mars. There he meets the fifteen foot tall, four armed, green men of mars, with horse-like dragons, and watch dogs like oversized frogs with ten legs. His adventures continue as he battles great white apes, fights plant men, defies the Goddess of Death, and braves the frozen wastes of Polar Mars. In other adventures, the Prince of Helium encounters a race of telepathic warriors, the Princess of Helium confronts the headless men of Mars, Captain Ulysses Paxton learns the secret of human immortality, and Tan Hadron's idealized notion of love is tested as he fights off gigantic spiders and cannibals. Edgar Rice Burroughs vision of Mars was loosely inspired by astronomical speculation of the time, especially that of Percival Lowell, who saw the red planet as a formerly Earth-like world now becoming less hospitable to life due to its advanced age. Burroughs predicted the invention of homing devices, radar, sonar, autopilot, collision detection, television, teletype, genetic cloning, living organ transplants, antigravity propulsion, and many other concepts that were well ahead of his time. The books in the Barsoom series were an early inspiration to many, including science fiction authors Robert A. Heinlein, Arthur C. Clarke and Ray Bradbury, they influenced renowned scientist Carl Sagan in his quest for extraterrestrial life, and were instrumental in the making of James Cameron's Avatar, and George Lucas' Star Wars. This edition includes 35 illustrations by Frank Schoonover, J. Allan St. John, V. Cutta, P. J. Monahan, George Wildschut & Frank R. Paul. I'm pretty sure these are all public domain (expired copyright) and available for free legally from Project Gutenberg.